Thanks to aecregent for this photo of 172 TTT172X one of three Olympians that were with Plymouth Citybus for a short time. These buses were destined for a short spell in Plymouth - and I must admit I was never that impressed with them as the Atlanteans seemed much better and these had the ugliest front ends of any bus I had come across before. 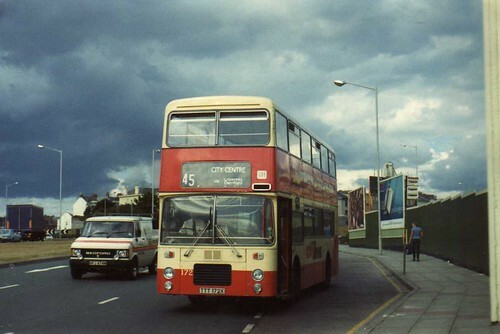 Of course since then I have realised that East Lancs specialised in ugly buses and that we were just lucky that our Atlanteans were actually quite good looking buses. I also seem to remember one other odd fact about these buses - Citybus with their long history of Leyland buses registered their Olympians as Bristols, while a couple of years later Western National, long time Bristol operators registered their first Olympians as Leylands. Of course as I sit here having already had a few too many 'fizzy drinks' I may be wrong about this! Finally - Happy New Year to all my readers and visitors to this blog. Much more to come in 2008 so plenty to look forward too. I hope you all have a great 2008! It's possible that your correct about the Plymouths Olympians being registered as Bristols. When the Olympian was launched in 1980/1 proudction was at Bristol until BCV's closure in 1983 when production was moved to Workington. From then most Olympians were registered as Leylands.